Phyllis Ilene Neill, 91, of rural Bellevue, died Tuesday, July 24, 2018 at the Willows of Bellevue. She was born August 22, 1926 in Tiffin to Claude & Mary (Braden) Swartzmiller. Phyllis graduated from Tiffin Columbian High School and worked as a secretary at Bellevue City Schools. 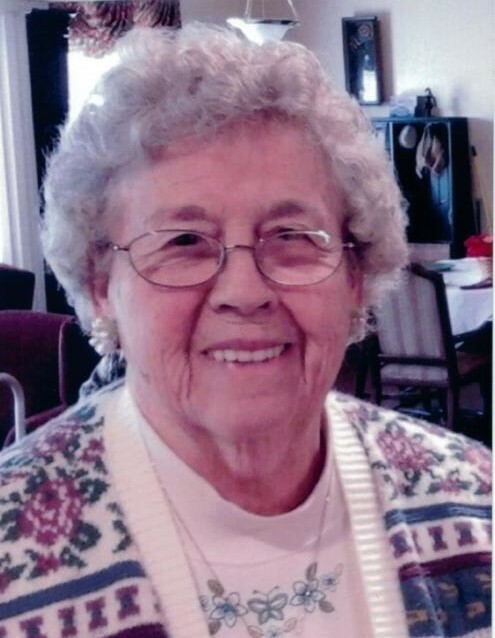 She was a member of St. John's Lutheran Church in Bellevue and the Ohio Federation of Farm Women Club. On May 26, 1946 she married Elmer S. Neill. He preceded her in death on September 1, 2013. Survivors include their son, Ronald (Patricia M.) Neill of Bellevue; grandchildren: Laurie (Roger) Hunker; John (Judi) Neill; Ronda (Clint) Minniear; & Mike (Kelley) Neill; great-grandchildren: Megan (Jacob) Ruffing; Sarah and Austin Hunker; Nathan and Grace Giles; Luke, Macie, and Jacob Minniear; Kyle, Tom, Bryan, Morgan, Tyler, and Blake Neill; brother: Bob (Judy) Swartzmiller of Bellevue; sister, Sharon Leach of Florida; brother-in-law, Gene Nagel of Attica; sisters-in-law: Judy Swartzmiller of Mansfield; Sandy Swartzmiller of Worthington; Sue Swartzmiller of Georgia; nephews: Jim Ball of Chicago and Gary (Shirley) VanKirk of Bellevue; and several more nieces and nephews. In addition to her parents and husband, Phyllis was preceded in death by her daughter, Patricia I. "Patti" Neill; brothers: Keith, Newton (Betty), Richard, James, William, Larry; sisters: Connie Nagel, Lois (John) Ziegler; sisters-in-law: Edna (Don) VanKirk and Margaret (Walter) Ball. Visitation will be 10:00-11:00am Monday, July 30, 2018 at the Auxter Funeral Home, 1105 Castalia St, Bellevue. Her funeral service will be 11:00 Monday at the funeral home with Rev. Henry Seibert officiating. Burial will follow in Castalia Cemetery. Memorials may be made to Fish & Loaves, PO Box 121, Bellevue, Ohio 44811.